The iCan project uses a performance exhibition to examine artistic economies and social structures. 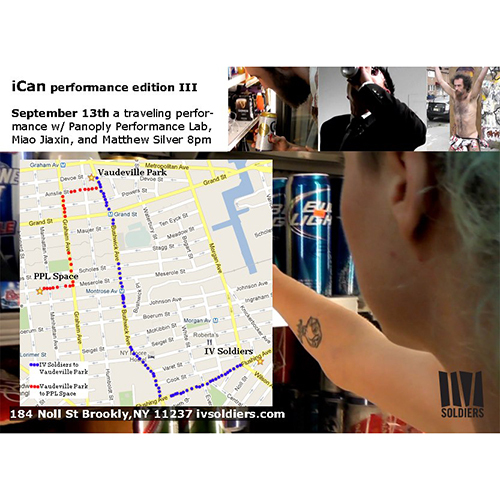 The performance exhibition involves performance art at IV Soldiers Gallery, PPL, and Vaudeville Park in Bushwick. It also involves social projects, a walking tour, and actions involving can collecting, recyclability, use of detritus, collective cultural organization/curation, and the existences/operations/problematics of the artists and their practices.Conceived and lead by Ivy Castellanos, collectively curated and organized by the involved artists: Chloë Bass, Ivy Castellanos, Quinn Dukes, Miao Jiaxin, Anya Liftig, Geraldo Mercado, Panoply Performance Laboratory (Brian McCorkle and Esther Neff), Itzy Ramirez, Hiroshi Shafer, and Matthew Silver. PPL performed three times as part of iCan: two early sketches for Any Size Mirror is a Dictator, one with a catapult and analog electronics attached to a remote-control car, burger-parts, and injury, one with instructions written on cards inside envelopes and noise-making analog electronics in cans, one entitled "Gentrified String Tour: I have become De-bored" (see smallscale performances). 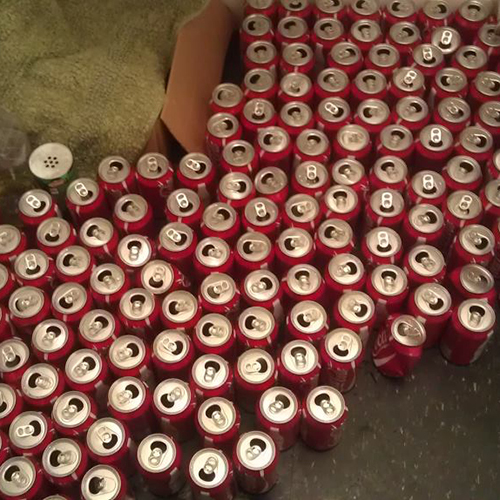 We also put dozens of "iCan" gold stickers on cans still filled with liquid in bodegas and grocery stores. Enacted in 1982, the New York State Returnable Container Law hoped to encourage recycling by giving back a rebate of 5c per aluminum beer or soda can. Performance artists have long been adept at recycling trash to make work, relying on the “readymades,” furniture, lumber, clothing, and even food that others discard. Similarly, we keep hearing that art can be relegated as a whole into a “sphere of excess,” lumping art-making in with leisure-time activities such as getting drunk, shopping for pleasure, and going to nightclubs. Can art be a part of daily life? Can it be a profession? Is it worth anything? Are artists useless members of society? The iCan project roots through the garbage for practical responses to these questions. The act of collecting cans becomes a collaborative social performance and an attempt at survival as 11 artists, lead by curator-project organizer Ivy Castellanos, use the returnable container laws to raise artist fees, gallery space and studio rental, transportation costs, and more. As cans accumulate in the gallery space IV Soldiers, filling up the front window, artists will make performances in and with the cans each Thursday night in September. For the months of July, August and September, the artists will also collect cans on the street and through several performance spaces, in conjunction with public project participants. The rebate from the cans will fund the exhibition as it is going on, creating a sustainable (yet socially fraught) cycle of performance, product, and purpose. The exhibition is part of an overarching self-sustainability initiative, during which the artists will work together to make their practices economically self-sustainable while trying not to blight their local communities or cause environmental damage. Anyone can bring 12oz. aluminum cans to IV Soldiers Gallery Tuesday, Wednesday, and Thursday 7-9pm through August or by appointment (ivsoldiers@gmail.com). Performances will take place in and using the cans on the Thursday nights in September at IV Soldiers. Cans will also be collected at Panoply Performance Laboratory (104 Meserole St. Brooklyn) throughout August.